I've been thinking about the political scientist and anthropologist James C. Scott. He once observed that when folks who haven’t gotten to speak on the public stage finally arrive, they can sometimes be seemingly incomprehensible because by the time they reach that point, because they have so much. I worried a little about speaking on Houston A. Baker’s work. I’ve thought on aspects of his writing for so long that I was a little concerned. I wondered if what I’d say would be incomprehensible because now that I finally have a stage, I might have so much to say. Most notably, I've been particularly moved by Baker’s concentration on “Generational Shifts” in African American literary studies and expressive culture. His landmark essay on “generational shifts” first appeared in African American Review (Black American Literature Forum) in 1981. Later, an extended version of the essay appeared in Baker’s book Blues, Ideology, and Afro-American Literature (1984). In his essay, Baker spent time discussing shifts or changes in literary-critical and literary theoretical paradigms over the decades, moving primarily from the 1950s and 1960s. He really delved into the shifts among African American writers, which is to say that he was discussing intra-racial continuities and conflicts among black artists and scholars. 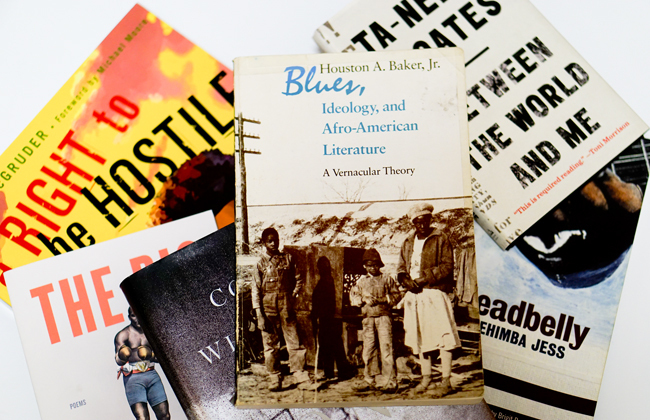 Professor Baker's work was groundbreaking for the extensive acknowledgement of an extended tradition of black literary-critical work. His work also anticipated so many contemporary studies, including, to mention just one, Lawrence Jackson's wonderful The Indignant Generation: A Narrative History of African American Writers and Critics, 1934-1960. (Note in the titles, Jackson's "generation" and Baker's "generational"). I want to pause here and say that I’m not necessarily an expert on Houston Baker. But I have been a witness. You know, when the people come through and want to know has anyone, I don’t know, maybe a black boy from Jackson, Tennessee, who then attended Tougaloo College in Mississippi, if those people come and ask “well, has African American literary criticism actually done anything for anyone, for your thinking?” Then, I’m one of the the ones who’ll raise his hand and say, “unh-hunh, and I’ve been a witness.” I've been a witness to important work in the field can do. I've been a witness to the work of Trudier Harris. I've been a witness to Maryemma Graham and Jerry W. Ward, Jr., and Joanne Gabbin. I've been a witness to the work of Houston Baker. I was an undergraduate, and I wasn’t reading Baker’s work as part of a course. I was reading on my own. I was confused and misunderstanding the references and terminology and critical discourse. Things were going over my head. The good news, though, the good news about my struggles comprehending was that I was inclined to continually return to his work over a long period of time, over years, over a decade now. In the process, I absorbed his work and ideas about generational shifts and continuities in ways that I had not expected. Since 2011, I have published roughly 200 or so entries each year on my blog, Cultural Front. A large subset of my entries concentrate on lists involving African American artists, including poets, rap artists, musicians, and scholars. And here’s the Baker connection. What I’ve discovered when I look back on some of those lists is that I’ve essentially been working through different shifts and continuities among black folks. What I’m doing corresponds to what I first encountered reading what Baker proposed in his article on “generational shifts." Let’s return to Houston Baker. He was thinking about generational shifts. He was thinking about changes and continuities among black artists and scholars over time. After continually alluding to, borrowing, incorporating, and reworking his initial ideas, I developed a guiding question: in what ways and to what ends have markets or fields influenced what happens to different generations of African Americans? Aspects of that question have really shaped some of my most far-reaching online work over the years. One of the benefits of presenting this work online is that I don’t have to wait for the long, long lag time of, say, conventional articles or book publications. I can compile lists fairly quickly. And in process. I’m also in a position to link to various seemingly unrelated lists in ways that are not possible if I was devoting myself to a single, presumably focused book project. As a blogging project, though, it’s possible for me to cover more over time and space over the years. The extensive work that I’ve done on Colson Whitehead, Ta-Nehisi Coates, Aaron McGruder, Kevin Young over the years is viewed as a project on black men writers. It is. But what's really crucial to me is that they are black men of a certain generation. The largest body of online work that I've produced over the years has been on black poetry, yes, but that work, at least in my mind, is so often about what the field means for artists and readers at distinct moments in time. In other words, you don't have far to travel in any direction in my work to find the presence of Baker's generational shifts.